Now the colder weather has well and truly arrived in the UK and it’s the season for setting new goals, I have finally had the opportunity to test and review a running jacket and tights sent to me by Gore Running Wear from their Mythos range. I have always associated the Gore Running Wear and Gore Bike Wear brands with quality and fellow runners at my club have spoken highly of the products. I was therefore excited at the prospect of taking them out on a test run..
I’ll cover the jacket and tights separately and in more detail in a moment but what is true across both is that they are extremely well made from the fabric’s used to the fit of the apparel. Gore Running Wear is priced at the premium end of the running wear market and the reasons for this are immediately obvious when I compared to other kit I regularly run in. Gore sent me size XL in both the jacket and tights, I would usually wear a size Large but they do fit slightly on the smaller side so the one size larger was needed for a comfortable and close fit. The fabrics offer a good level of stretch, they are extremely soft and this remains the case after several wears and washes, the shape of the jacket and tights is also just like on the first wear. Whilst this may seem like a basic for leisure wear it’s something that many brands are just not delivering in their products. 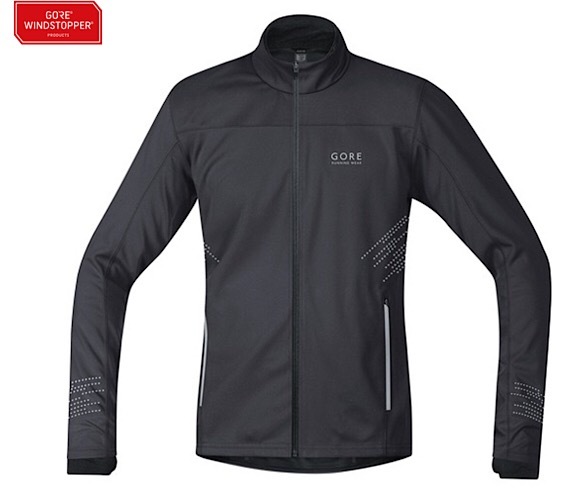 Jacket – The Gore Running Windstopper lives up to its name thanks to a special double collar and cuff construction which stops the cold gaps and has well placed reflective details on the back, arms and on the zips to give good visibility when night running. Ventilation in the back of the jacket ensures excellent breathability whilst remaining highly wind resistant and water repellant (not waterproof). Sleeves are a good length with an inner cuff sleeve and thumb loop. 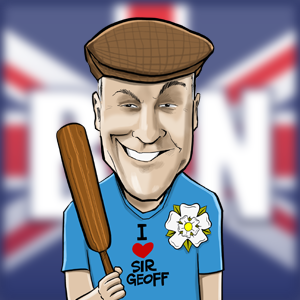 They are available for Men and Women and in a few colour ways rather than just plain black so give options for everyone. 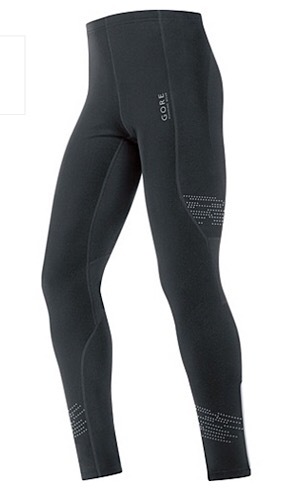 Tights – The Gore Running Mythos 2.0 Thermo Tights are absolutely ideal for colder conditions. I tested in -2 degree’s centigrade and the next to skin fit and “napped” inners kept by legs and muscles comfortably warm even when working hard on tough hill runs. Just like the jacket there is well placed reflective detail on the thighs, calves and the bottom of the leg zippers to ensure good visibility when night running. Another really important detail is the slightly wider very flat waist band and draw cord which ensure a very comfortable fit. Like the jacket, they are available for Men and Women and in a few colour ways rather than just plain black so give options for everyone. Overall, the Gore Running Windstopper Jacket and Mythos 2.0 Thermo tights are an absolute 5 Star recommend from me, all serious runners whether on the roads, tracks or trails know that technical performance apparel needs to deliver when it matters and the Gore range does exactly that.